How did things turn so bad for Zimbabwe’s president, Emmerson Mnangagwa? He won the disputed elections in August 2018, but even before the results were officially announced, protesters were being shot in the street, with the security forces laying into the protesters in front of the world’s press and international election observers. If those observers were contemplating a reluctant and muted endorsement of the results, then the shootings served to ensure that endorsement was not forthcoming. Riot police armed with tear gas also threatened to storm the Bronte Hotel where many observers were staying – to prevent a press conference by the leader of the opposition, Nelson Chamisa. I witnessed this as I was staying at the very same hotel. Once again, their threatening posture was filmed and broadcast in real time, and many observers – senior figures in their own countries – standing near me were pushed about by the security forces, as was I. And so Mnangagwa’s mantra of Zimbabwe being open for business began to wilt away right from the outset. But more was to come. In January 2019, riots broke out to protest a huge hike in the price of fuel. 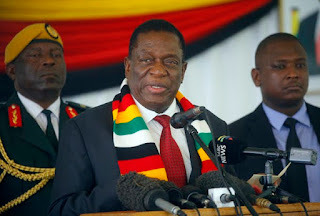 Mnangagwa announced the price rise before leaving the country to visit Eastern Europe to seek investment and address the World Economic Forum event in Davos. It was as if he was unaware of the fury a doubling in petrol costs would trigger. With former defence chief General Constantine Chiwenga in charge as acting president, the protesters were met with a furious militarised response. The response was so radical that police officials secretly showed The Guardian journalist Jason Burke documents directly implicating the military. Government claims that those involved in the shootings and beatings were gangsters in stolen uniforms seem highly unlikely. Mnangagwa hurried back without making it to Davos, and promptly promised that those who had killed, beaten and raped citizens would be punished. But he must know that to do so he will have to take on Chiwenga – and many Zimbabweans are convinced that Chiwenga, a hard military man rumoured to have the army behind him and never convincing in a civilian suit, seeks the presidency for himself. He would likely relish a confrontation with Mnangagwa as a prelude to deposing him or forcing him to resign. Three things are clear as Zimbabwe enters what looks set to be a troubled 2019. First, there is a divided leadership – whether rumours of palace coups are real or not. This is partly because no one knows how to lead Zimbabwe out of its economic mess. And, as things become more chaotic, many in the ruling ZANU-PF party think there is no choice but to brazen out the economic meltdown by ruthlessly squashing any political protest. As it is, Chiwenga – who reportedly is now receiving medical treatment in India – probably can’t move against Mnangagwa while Cyril Ramaphosa remains president of neighbouring South Africa. Ramaphosa, who recently called for sanctions to be lifted on Zimbabwe, has made it very clear behind the scenes that he will not tolerate a coup – and the meagre liquidity which does seep into Zimbabwe comes in large part from South Africa. Squeezing Chiwenga dry by economic means is well within Ramaphosa’s capacity. But while both Mnangagwa and Chiwenga are unwilling or unable to move against each other, Zimbabwe is left with a divided government, a stalemate that means even less agreed action on the economy. Second, the president is genuinely unable to gauge the mood of the people, or to understand how deeply they are affected by economic malfunction while they watch the financial malpractice of so many in the ruling elite. It is as if the material comforts of protected suburbs such as Harare’s Borrowdale Brook insulate the ruling oligarchic elite from any sense of what deprivation means. Third, the much-touted “technocratic” finance minister, Mthuli Ncube, is out of his depth. Faced with an informal money market where government bond notes were rapidly losing value against the US dollar, and where there was a huge shortage of US dollars, small business operators in Zimbabwe turned to electronic cell phone transactions – establishing a kind of rough and ready but robust virtual economy. But Ncube’s decision to tax these cell phone transactions immediately knocked the confidence out of that form of exchange. The textbook says you must broaden the tax base and the new tax did just that. But it was also naïve in the extreme, as it broke the back of any vibrancy left in the Zimbabwean street-level urban economy. Ncube’s naivety was again seen in the fuel price hike. There is no fuel because the country has insufficient foreign exchange to import the petrol needed. Again, the textbook says that when supply fails to equal demand you must do one of two things: either increase supply, which is impossible in Zimbabwe, or dampen demand. The price rise sought to achieve the latter, but it brought the possibility of economic life for a huge number of ordinary people to a standstill. The price of transport into town to work, to look for work or to sell or buy whatever is available in the street markets became prohibitive. One price rise has therefore caused a multiplicity of damaging consequences. Ncube now proposes a return to a national currency within a year, rather than future reliance on the US dollar. This will almost certainly mean another wave of hyperinflation, the very reason why the previous national currency was abandoned and the US dollar adopted. The greatest mistake of the Mugabe years was a refusal to take seriously the simple truth that production leads to exports – and exports earn foreign exchange. Zimbabwe has become a consumer society – led by the political oligarchs – in which the cost of imports far exceeds the returns from exports. Production has been so undervalued, and so poorly invested in, that it costs more to produce something as basic as a bottle of cooking oil than it does to import it from South Africa. Ncube’s first budget as finance minister was woefully short of meaningful incentives to encourage production and deal with this problem. And so Zimbabwe is held back by three key things: a quarrel at the top that means government is too preoccupied and divided to focus on proper planning and economic management, lashing out at its own people instead; a disastrous inability to feel the popular pulse, with the ruling oligarchs now living in a hermetically sealed world of their own; and the ongoing economic naivety of those who should be managing the nation’s finances. Mugabe financed Zimbabwe with massive borrowing. But no one will now lend to Zimbabwe. The International Monetary Fund (IMF) wants its loans repaid. China is waiting for some sense of fiscal responsibility to return. And South Africa will not give support to allow the purchase of fuel since it also is owed much money by Zimbabwe. Indeed, even if Mnangagwa does move to meet IMF conditions, it will mean years of even greater austerity for Zimbabweans. Sadly, there will be no happy ending for Zimbabwe in 2019. Originally published in The Conversations UK. Stephen Chan is Professor of World Politics, SOAS, University of London.